Well, if like me, this was an event that you couldn't attend then fear not, as Curling Stones will attempt to bring the event to you! I must admit this is getting to be a nasty habit missing out on all the lovely Trollbeads fun! The event unfolds from the viewpoint of the customers and finishes with Liz telling her story from the other side of the counter... me? I just interrupt here and there... oh and I get to have the last word too! 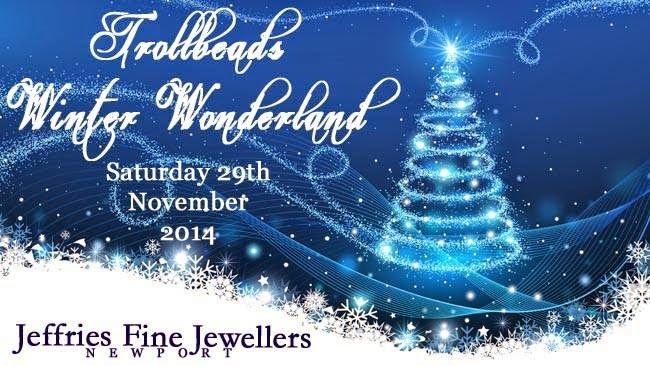 Benfleet, Essex to Newport, Gwent - - joy, I am there for Trollbeads Winter Wonderland at Jeffries the Jewellers!! Arrived midday just after a Trollie invasion had left! The window was sparkling with fabulous bead arrangements set in a twinkling snowflake display. Inside, festive decorations adorned the walls, a selection of drinks and tasty nibbles invited me to sit and enjoy whilst being warmly welcomed by Liz. The displays were eye-catching, featuring the distinctive Schmuck Vitrine box, to be won in a raffle held for Sparkle, a charity for disadvantaged children in the area. The Trollbeads candlesticks and dish were prominent, awaiting the draw to be presented to a loving owner. On arriving home this week, I discovered it was . . .ME!! Liz showed me the uniques for the event and a multitude of beads - of course! I selected the Magical Winter bead with SPARKLE, an Amber Violet as the violet colour was so very rich and deep, the Koala to remind me of a friends recent visit to Australia and, inspired by the simplicity and beauty of the window display, the most stunning Christmas Tree. I had not thought much of it in pictures, but in the ‘flesh’ . . .WOW! So thanks to the breathtaking combination on a bangle by Liz, that caught my eye and her guidance to assemble the bead, I am one thrilled owner. Then, surprise, Liz had added an Advent calendar to her display as an extra surprise treat. Choose a date - I chose 2nd and Honey Dawn was my gift. Now came more, my purchases had hit the jackpot and Liz produced the sublime Trollbeads jewel box as a gift!! I was in heaven!!!! What a lunchtime spectacular and one elated and shocked Trollie!! This was my 2nd visit to Jeffries, having discovered they had recently started to stock Trollbeads, Liz is the most engaging lady and a fabulous representative for Trollbeads. I had the most wonderful time and was thrilled with my haul! I heard about the event at Jeffries through the 'Curling Stones For Lego People' blog which I also follow on Facebook. 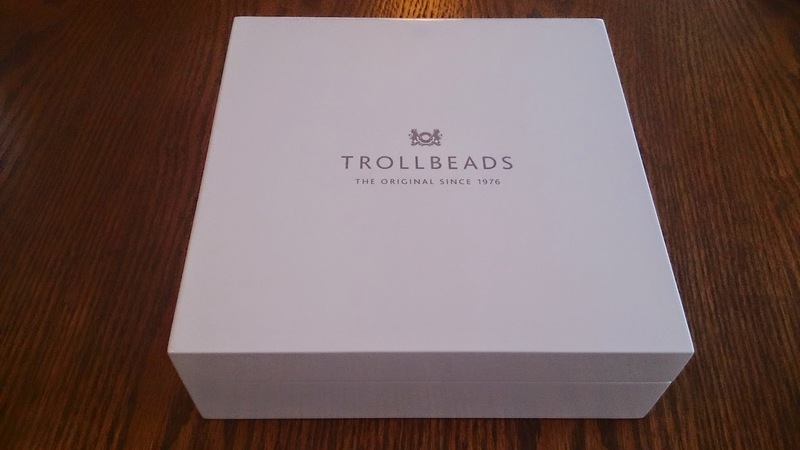 The event sounded amazing with lots of goodies on offer with a free, yes I said free, Trollbeads White Storage Box with a spend of £150 or over! Firstly, many months ago my best friend and I purchased tickets to see Paul Heaton and Jacqui Abbot of Beautiful South fame in concert. My daughter-in-law Abi was finally given the date for her major knee surgery and forgetting all about the concert I booked a week off work to go away to look after her (my son works very long hours). It wasn't until I mentioned the date to my friend she realised it was in the same week, the Jeffries event clashed too! However fate looked kindly on me, Abi's operation turned out not to be as extensive as originally planned. So I was able to hop on a train on Thursday afternoon of the 27th Nov and another two train changes later arrived in Cardiff just in time for the concert (which was excellent by the way). This also meant I would be free for the Trollbeads or so I thought! Argh, I can't believe your tale Tracy... did you ever get there?????????? I hadn't been to Newport for years as I do all my non food shopping in Cardiff but managed to find the store, walked in and all was quiet. I was introduced to Liz and made to feel very welcome. She said there had been a mad rush in the morning. I was given a glass of bubbly and sat down to gaze at the gorgeous beads Liz put in front of me. Liz mentioned all the boxes had gone but amazingly kindly offered to order me one. I was excited beyond belief at the prospect of getting my hands on one of those. Then to top it all you also got to choose a number on the advent calendar. There were only 3 numbers left out of 24 which shows how busy they were earlier. Out popped the very lovely 'Cool Dusk' this, together with a goody bag, meant I left the shop on cloud nine! I believe except for a small selection in John Lewis there are no Troll stockists in Cardiff so Jeffries will now be top of my list for the continuation of my Trollbeads adventures! A quick selection of combos plus the box which arrived 3 days later, now that's what I call brilliant service! The good thing about getting a free bead is it can set you off thinking of creating a new project! As soon as the invitation was extended to attend “Winter Wonderland” there was an expectation that we would have a good day following the “World Trollbeads Day” event on August 1st. I left bright and early to travel the 26 miles to Newport and others travelled even further, by car and by train, to join in the fun. On entering the shop it was obvious how much effort had been put into making the shop a winter wonderland, so very tastefully decorated. Tea and coffee was available throughout the day and we mustn’t forget the mince pies and chocolate cake on offer. Liz had made every effort to source beads to cater for all our tastes and she also wanted to make the day a happy, fun event for us. It must be very difficult to continually improve on each event but there were lots of little touches that made this day a success. After making a purchase we were asked to choose a number on the advent calendar. 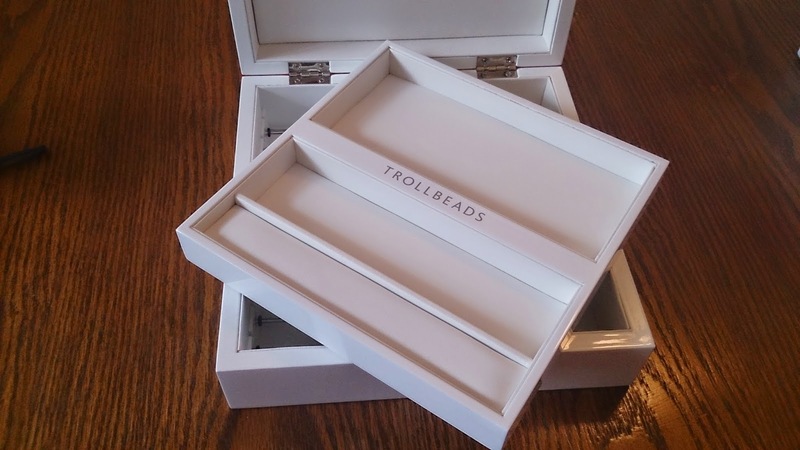 Each number held a Trollbeads in the pocket – how great is that…to have a free bead? I love mine! There was also a free draw (with purchase) to win a starter bracelet and the raffle for the local children’s charity is ongoing. 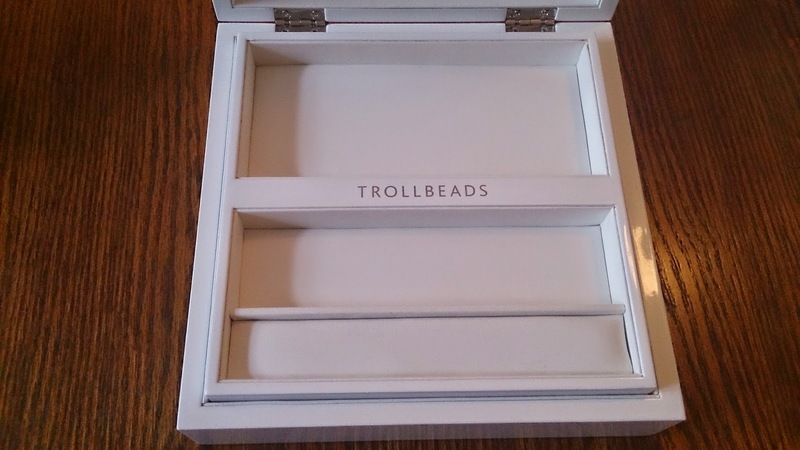 The absolute best offer of the day was the gift of the white Trollbeads jewellery box with a qualifying spend. There were lots of happy trollies clutching boxes as they left the shop…and I was one of them! Thank you Liz and Scott for your hospitality and generosity – I, for one, had a lovely day with my friends and appreciate all your efforts to make “Winter Wonderland” the success it was. Okay, now I need a Tardis so I can travel back in time and get me another white jewellery box... curating this tale of such a wonderful event is getting me all hot under the colour about missing out! By the way did you know in our house the 25th December is known as "Dr Who Day"? All communication devices are unplugged and turned off lest we get disturbed during that special time. The day was absolutely amazing, I couldn't believe how many people turned up! My only regret is it went by in a whirlwind and I didn't get to talk to everyone!! TB HQ for those who felt they had missed out. We had an advent calendar in shape of a tree which in each numbered pouch had a free bead behind it. The first 24 people got to pick a number from this calendar after their initial purchase! There were free gift bags for every customer containing Trollbeads merchandise and sweets. We had the offer on of if you buy 5 uniques you get a 6th for free of your choice. Amanda brought a bottle of cava and announced the launch of her website - which she had asked beforehand if it was okay to do at the event - of course!! Bless her for bringing extra drink...I had bought some already to celebrate with her! ;) haha. Her website is called wikibeadia & is a fantastic idea to keep Trollbeads archived information! I was honoured she chose our event to promote it and am still popping her business cards in Trollbeads bags! Every Trollbeads customer was entered into a prize draw to win a starter bracelet...which had the pink fantasy flower bead along with a flower lock on it. There was also two candle and bowl sets up for grabs...one of which we promoted through a facebook like and share competition, the other we thought we'd have exclusively for those who attended the event...to upload a picture to facebook or Instagram of their purchases from the day and tag us in them! We had a great response and loved seeing what everyone had done with their purchases from the day! All winners have since been drawn from a hat and announced. We managed to raise more money for the sparkle appeal through the raffle but are aiming for more.... Hopefully throughout December we will raise a lot more for them! WARNING - SHAMELESS PLUG FOR JEFFRIES CHARITY RAFFLE AND THEIR CHOSEN CHARITY SPARKLE! Don't forget that you can still enter Jeffries Charity Raffle for children's charity Sparkle... details can all be found here on their website. If you're local you can pop in to see them and buy a ticket in person, or just to drool over the Collector's Case in person! Best of luck to Jeffries in raising money for such a good cause, I hope you raise LOTS of money, and best of luck to all who have bought tickets! I have mine; do you have yours? What do you think about these special Trollbeads Events? How far would you travel for an event like this? Jeffries put on an amazing event as usual - they really "get" us collectors. And of course as Liz pointed out, I launched my new trollbeads website there - WikiBeadia. Reference Pages for Trollbeads Collectors. Thanks again to Liz and Scott for putting on such a brilliant event - and good luck everyone for the draw for the Schmuckvitirine - still time to buy tickets, and a great cause! Congratulations on your launch, love your site! 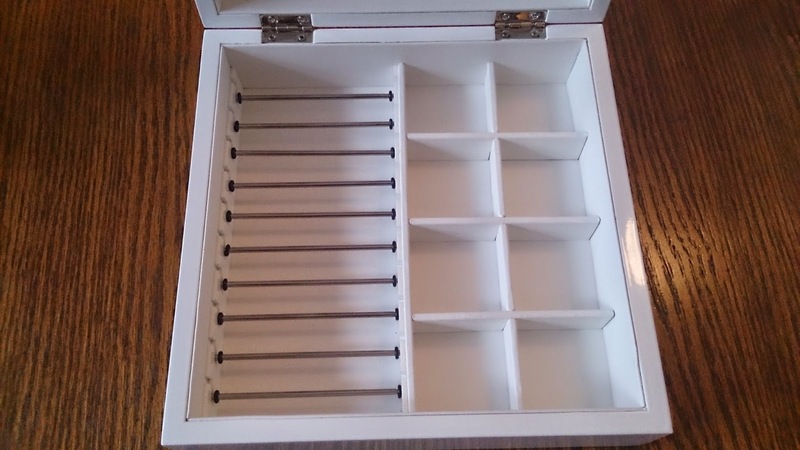 Your DD is very lucky, I love my white jewellery box, initially when it came out I was all "I don't do white" then I saw Pauline's and how much it held and I was all "Where can I buy this, I need it now!!" Hope you all managed over Christmas with the broken arm... my husband broke his big toe once on my birthday (which is the week before Christmas), I remember it well!!! !